The cyclonic circulation over the Andaman sea is to develop into a low pressure area. The models expects the low to move Southwest and prevail over the open waters of Southern Bay of Bengal for the next couple of days. Tamil Nadu is expected to receive scattered rainfall. South interior and Delta districts are to witness moderate to heavy rains for the day. With the slight strengthening of the easterly winds, Coastal Tamil Nadu is likely to receive light to moderate rains from the localized thunderstorms. Foggy mornings for Assam, Meghalaya, Nagaland, Manipur, Mizoram & Tripura. Isolated showers are possible at South interior and coastal Andhra Pradesh and isolated places of Karnataka, with rest of the country remaining dry. 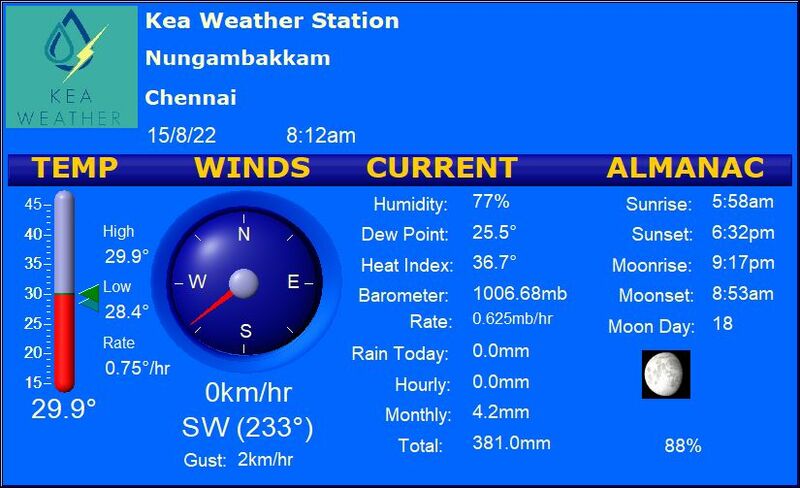 Chennai – A day high of 29/30C and low of 24/25C with light to moderate showers for the day. Vellore – A day high of 30C and low of 25/26C with light rains likely. Coimbatore – A warm day with maximum temperature around 28/29C and minimum of 23/24C with fair chances of precipitation. Trichy – A day with temperature around 29/30C and minimum temperature of 24/25C with moderate showers likely. Madurai – A day high of 30C and low of around 24C along with light to moderate rains.